Kiev's decision to halt integration with Europe will have negative consequences for Russia, which has developed over the past 20 years to a large extent because it developed closer ties with its more economically developed neighbours. The Ukrainian government halted the integration process with the European Union last Thursday. 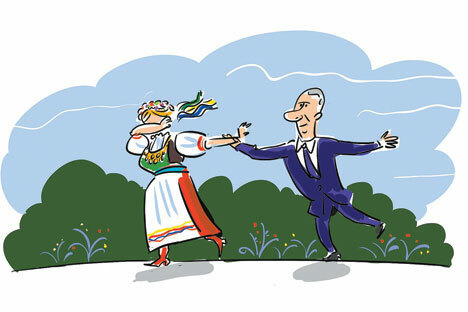 Ukrainian President Viktor Yanukovych will not travel as planned to Vilnius this week to sign the Association Agreement. That decision has caused a heated debate among Ukrainian politicians and their electorates. The tens of thousands of people who turned out in Kiev's central square to protest the decision represent the first sign of widespread discontent. But I am not losing a lot of sleep over Ukraine's fate. Of course, I rooted for their football team during the recent play-offs with France, but in the end it is their choice which path to take, just as it is their decision whom they elect as president. What really interests me is Russia's fate, and I believe that Kiev's decision to halt integration with Europe will have negative consequences for Russia. There are two simple reasons for this. First, if Ukraine became an associate member of the EU, Russia — a country that shares a huge common border, a common history in many areas and strong economic ties with Ukraine — would effectively grow closer to Europe as well. Second, Russia's geographic proximity to the developed countries of Europe is a key factor behind its economic development. Russia would benefit even more if the EU removed trade barriers for Ukraine. Political theorists might see advantages in a Customs Union with Belarus and Kazakhstan, but only the more intensive trade with Western Europe can support real economic development in the long term. Russia's economy has developed over the past 20 years to a large extent because it developed closer ties with its more economically developed neighbours. Although the former Soviet republics have integrated very little with Western Europe over the past 20 years, the rate of their convergence has largely been a function of how closely they have been connected with neighbouring states. In a report that he presented at the International Institute for ­Applied Systems Analysis conference in 2012, UCLA political science professor Daniel Treisman showed that a country's progress depends on exactly which other countries it borders. If developed economies tend to improve the prosperity of their neighbours, this means that by closing the doors on Ukraine's integration with Europe, Russia has inadvertently hurt its own chances for progress as well.